DREAMING OF A TREE HOUSE is a film about the pioneering community-building project of the world-famous architect Frei Otto in Berlin, called the Okohaus-an experimental, ecological, customized housing project in the city center. Including interviews with Frei Otto, Christine Kanstinger-Otto, Hermann Kendel, Yona Friedman, Anne Lacaton & Jean-Philippe Vassal, and other involved architects, planners, and inhabitants, the film shows the development and the philosophy of the project, which was built for the International Building Exhibition in Berlin 1987 (IBA). 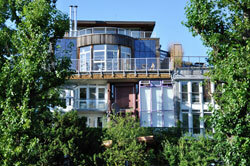 The "Ecohouse" project hosts a number of experimental solutions to adaptable home building and personalization. The film explores the ideas that motivated the project, its underlying sustainability themes, and asks how these ambitions were realized. 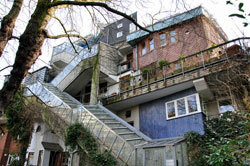 DREAMING OF A TREE HOUSE ultimately asks: What can we learn from the Okohaus? How can its design, building process, and the experience of its 20-plus year occupation inform ecological and design issues currently relevant to our society?